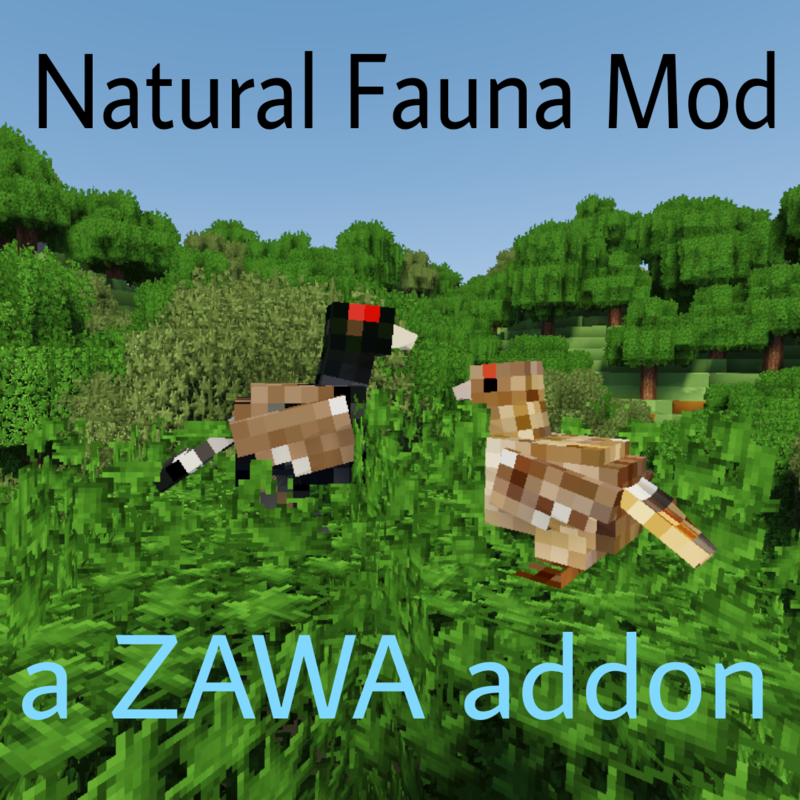 A ZAWA addon that provides lots of new animals such as cheetahs, capercaillies, and gnus! This addon will no longer be seeing new features! Hey there! This is an incompatibility with the latest ZAWA update. A new version of Natural Fauna will be released soon (I'm aiming for this weekend) to fix this and bring the new config feature. Hey, M! I'm guessing that Lil' Critters will also be affected by the "bad news". So, will you be merging the mobs from Lil' critters to this mod? By that I mean, will you be merging both mods into one? The config file is definitely coming. No worries, I promise! The animals are extremely cute and add great ambience, but as others have stated the spawn numbers are craaaazy high. Can't wait for the promised config! Gosh, so sorry to hear that! I'm hoping ZAWA 1.5.0 will be out soon, that way the next version for Natural Fauna here can be most up to date + a config! This mod crashes with the latest version of ZAWA 4.0. Please use an issue tracker so that it's easier on us to report things like this and easier for you in a lot of ways as well. Hey there! I've just released the newest version of Natural Fauna for ZAWA 1.4.0 and the github issue tracker is now linked at the top of the page for future use. Thank you for your feedback! Thank you for the update and for linking the tracker. What version of the mod is compatible with ZAWA rebuilt? when ever i spawn a mob in 1.12.2 it just becomes a white box i'm guessing that's their hitbox but it's nothing but a white cube. ZAWA updated recently and this mod causes the game to crash when attempting to load. i can provide crash log but currently trying to figure out a different crash. assuming it's because it updated. Yes I know. Just letting the mod author know that it crashes it the most recent version. It worked with the version before. I think they know and may are about making the update or waiting for the next ZAWA version.